Watch your students improve their sentences writing daily with writing prompts for specific phonics skills and sight words: phonics short vowel sounds /a/, /i/, r-blends and end blends -nd, -st, -nt, -nk. Put these in pages protectors for practicing writing different sentences over and over! 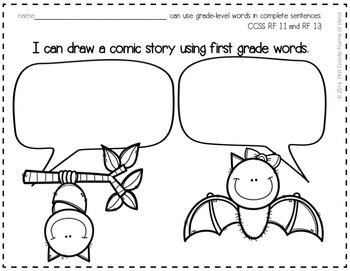 So many possibilities with the comic strip creative writing format as a prewriting activity! Use for writing centers, morning work, homework. No prep! Just print and go! Each week students will have 5 days (pages) of the same sight words to choose from and they will work with a word following a specific phonics rule for that week. 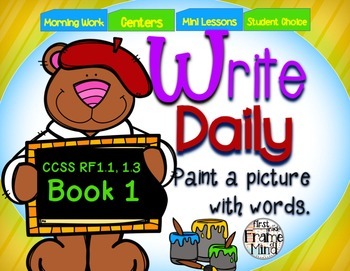 Write Daily Book 1 challenges students to create their own sentences follows a weekly phonics skill and then critically choose one of a handful of sight words to make a sentence that makes sense. 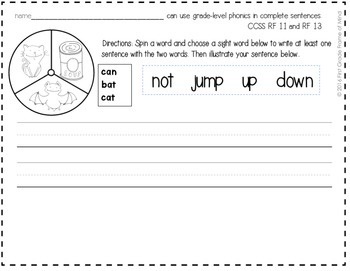 The prewrite/drawing pages may be used to encourage your students to use the phonics and sight words in a creative way. Challenge them to use as many of the sight words and phonics words for that week in their very own comic strip! NO PREP CENTERS that are easy for primary students to understand after you've completed one with them to show them how to choose their words for their sentences. A lined handwriting page, which is included, may be printed on the back of each worksheet, if preferred. Common Core (CCSS) listed on every page for students and parents to see the focused skill. You get one TpT Credit for every $ you spend on TpT, for both a fair rating and a fair comment on the items that you purchase. Every 100 Credits is worth $5 that you can apply towards future TpT purchases!